I keep seeing the advertisements for at-home Invisalign. You only have to submit photos, etc. Do they work? There are several of these type of companies at the moment. None of them are actually aligned with Invisalign, which is a specific brand. They’re just sort of leeching off the name recognition to get people to click and learn about them. Some of them work and some of them are outright dangerous. However, all of them have one thing in common which gives me pause. You rarely, if ever, see a dentist. Yes, you submit photos. Yes, a dentist looks at those photos. What they’re not saying is there are things which even the best dentists can’t discern from a photograph, such as gum disease. While there are some cases, depending on their severity, which are obvious even in a picture. Most of the time it requires x-rays and some probing of the gums. Plus, molars are very difficult to see in pictures. Your oral health needs to be checked during treatment. Gum disease can derail your treatment process as well as your teeth. If gum disease progresses untreated you can lose bone mass and teeth. Seeing a dentist and getting the real deal when it comes to your Invisalign treatment means you get a jump start on fixing any issues which develop, such as the gum disease listed above or decay and tooth pain. Other times teeth have to be shaved in order to make room for treatment with crowded teeth. If those cases, you will be sent to a dentist even with these “do it yourself” treatments. But, you’ll likely be working with a dentist who is not invested in your case in any way. It actually takes some cosmetic dentistry skill to do this in a way which still allows the teeth to look natural. Additionally, there are other cosmetic procedures you can do simultaneously when you work with a dentist. 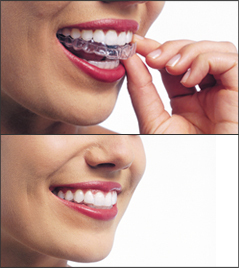 Your Invisalign aligners can double as teeth whitening trays, essentially giving you a mini smile makeover between the straighter teeth and a whiter smile. This blog is brought to you by Salem, MA Cosmetic Dentist Dr. Randall Burba.